A reason to make music? Well, it looks like update time is just around the corner. Propellerheads' Reason 4 is entering beta testing stage and as always I'm looking forward to it immensely. Thor, a polyphonic modular synth instrument, is one of the hottest new tools in the Reason 4 rack. It has six slots that can be filled with a variety of modules, including six different types of oscillator and four filters, as well as envelopes and effects. 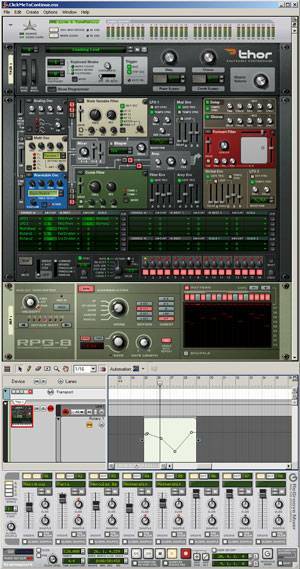 It is very light on CPU usage, according to Propellerhead. Also new is the Regroove mixer, which enables the user to apply groove quantisation to sequences, using a mixer-style GUI. Reason 4 will ship with a library of Regroove templates, some of which are extracted from original records. If that’s not enough, you’ll be able to add even more spice to your sequences with RPG8, a monophonic arpeggiator that can apparently be connected to any of Reason’s sound sources. The main GUI has been overhauled in the new version, and improvements include vector-enabled controller data, allowing for incredibly smooth automation, plus a multitude of new ‘lanes’, which can display alternate takes, automation data, and ‘folded’ information for each track.